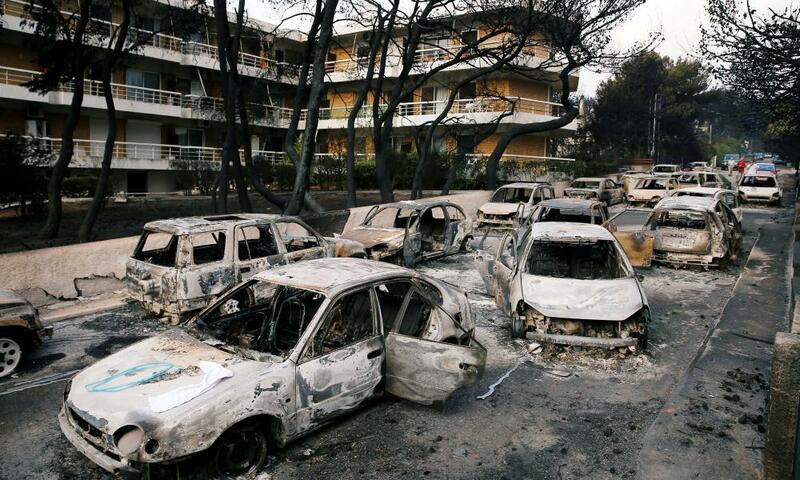 The worst wildfire to hit Greece in over a decade tore through a small resort town near Athens this week, killing at least 74 people, injuring almost 200 and forcing hundreds more to rush on to beaches and into the sea as the blaze devoured houses and cars. 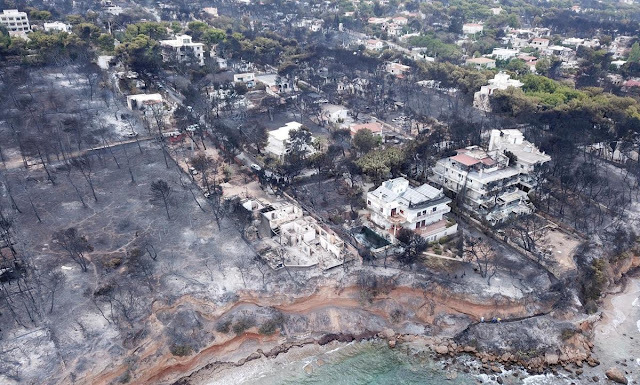 News reports suggest that huge, fast-moving flames trapped families with children as they tried to flee from Mati, 18 miles (29km) east of the Greek capital. Among the dead were 26 people whose bodies were found huddled tightly together close to the beach. 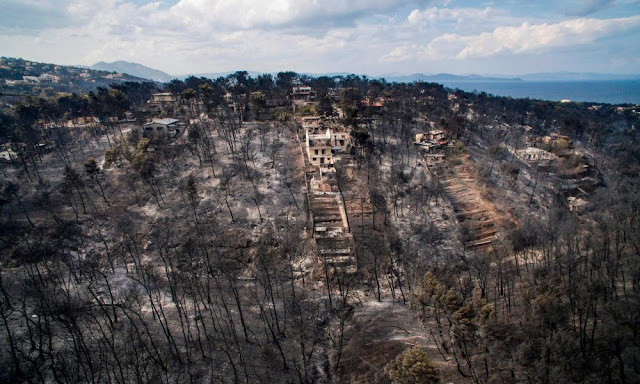 It was the country’s deadliest fire since blazes raged across the southern Peloponnese peninsula in August 2007, killing dozens of people. Uncontrolled blazes fuelled by weather, wind, and dry underbrush, wildfirescan burn acres of land—and consume everything in their paths—in mere minutes.On an average, more than 100,000 wildfires, also called wildland fires or forest fires, clear 4 million to 5 million acres (1.6 million to 2 million hectares) of land in the U.S. every year. There are three conditions that need to be present in order for a wildfire to burn, which firefighters refer to as the fire triangle: fuel, oxygen, and a heat source. Fuel is any flammable material surrounding a fire, including trees, grasses, brush, even homes. The greater an area's fuel load, the more intense the fire. Air supplies the oxygen a fire needs to burn. Heat sources help spark the wildfire and bring fuel to temperatures hot enough to ignite. Lightning, burning campfires or cigarettes, hot winds, and even the sun can all provide sufficient heat to spark a wildfire. Thus in any wildfire, it is more of combustible vegetation. Earth is an intrinsically flammable planet owing to its cover of carbon-rich vegetation, seasonally dry climates, atmospheric oxygen, and widespread lightning and volcanic ignitions. 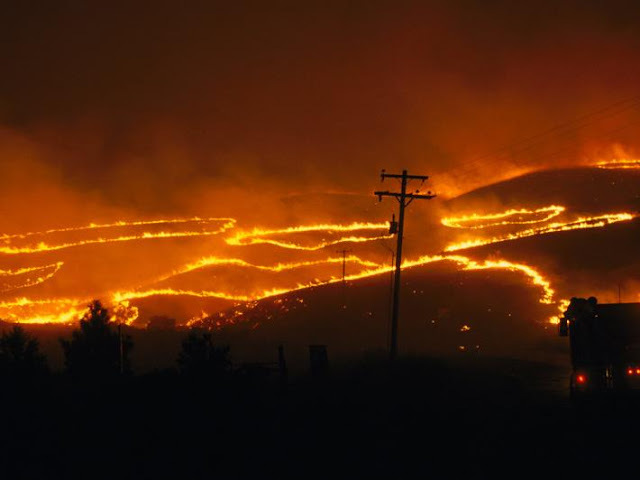 Wildfires can be characterized in terms of the cause of ignition, their physical properties, the combustible material present, and the effect of weather on the fire. Five days after devastating wildfires decimated seaside communities outside Athens, leaving 87 dead and countless missing, Greece’s embattled prime minister Alexis Tsipras has assumed political responsibility for the disaster.At an emergency meeting of his cabinet, he acknowledged that the tragedy had left him wondering whether his government could have done more to prevent such loss of life. “This is a difficult moment, perhaps the heaviest of our term in office,” he said. “The dead cannot talk, but the least we can do in their memory is to show respect for the truth.“Before the cabinet, and the Greek people, I want to assume full responsibility for the tragedy … I regard this as self-evident for the prime minister of a country to do – and I call on you to also assume responsibility, no matter how hard.”, said Tsipras. The leftist-led coalition has been left reeling as criticism of its handling of the disaster mounted. Tsipras, who assumed power in 2015, promising to radically change the way Greece was governed, admitted that he had been possessed by “mixed feelings of pain, devastation and anguish … anguish as to whether we acted as we should have done, if we responded correctly in these critical hours, and if we could have done anything more to save even one more of the souls who died unjustly”.The prime minister has not appeared in public since rushing back from Bosnia-Herzegovina on Monday when it became clear that wildfires were raging out of control barely 25km outside the capital. His absence has reinforced the outcry over the response to a disaster now regarded as Greece’s worst in modern times. With the death toll rising, the Queen joined other international heads of state in expressing her condolences this week. Addressing his sombre and downcast ministers, Tsipras said the disaster had left him fearing that out of an “instinct of self-preservation”, members of his government could have “made too many excuses to lessen responsibility” – even if the political opposition was also exploiting the disaster.But Tsipras’ coalition provoked further fury on Friday when the civil protection minister, Nikos Toskas, told a hastily arranged news conference that while he suspected that arson had caused the fires, he had found no indication “of grave errors” in the way they had been handled.On Thursday, the defence minister, Panos Kammenos, was heckled as he inspected the charred remains of buildings in Mati, the seaside village almost entirely obliterated by the conflagration and where most of the deaths occurred. Many victims are now known to have died after becoming trapped in vehicles as they tried to escape the fires. But with gale-force winds of up to 124km/h fanning the flames, the government has insisted there was no time to evacuate people from areas whose escape routes were blocked by illegally built summer homes.In a special report, experts from the University of Athens’ faculty of geology and geo-environment described Mati as a “fire-trap”, arguing that the resort’s anarchic construction had rendered fire safety impossible in an area well known for summer blazes. Sad ~ and somehow across frontiers behave more or less in typical lines and many a times care much less for the people they represent.